Confined and Shallow Waters (CSW) are an extremely complex operational environment. The very specific and unique conditions demand for a broad set of scalable capabilities meeting the multifaceted operational requirements for the full range of military operations across the entire spectrum of missions. The aim behind the project is to foster synergy in developing, procuring and, at a later stage, operating a set of compatible components, thus enabling nations to maintain a broader set of affordable and effective capabilities for maritime combined and potentially also joint operations, especially in the particular challenging environment of CSW. The fascinating part of this project is the underlying idea that the “tools” (sensors, effectors, and the enabling technology required to form a functional chain) are not integrated into a ship’s combat system. Instead, they will be self-sustained and ready for plug-in-and-play, requiring only basic external services like self-defence, power-supply, or catering and accommodation in case operators come along with it. What we are aiming for, is similar to the Smart Home principle, interconnecting various domestic devices. The price, the features or the performance of each device does not matter as long as they can be connected to the network. In order to ensure this, the manufacturer of a device must simply apply the respective standards, which are yet to be set. 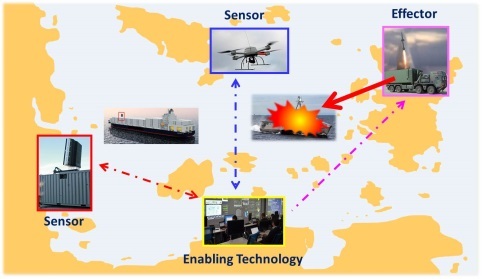 The project follows a rather unusual holistic approach, by identifying capabilities required for prospective operations in CSW, which may be combined in a composite maritime system or respectively be employed cross-sectional by deployable units of joint forces. We will, with an operational mind set, analyse the entire spectrum of principal warfare areas, in order to create cross-sectional solutions for as many capabilities as feasible. Thus the toolbox principle is: Tools required for a capability form a ‘toolset’, all add up to the ‘toolbox’ for CSW. On the bottom-line FIT FOR CSW, aims at evaluating the suitability of modular air, surface and subsurface components, capable to be deployed from a variety of platforms, respectively employed on board at sea, as well as from ashore. By employing tools that can be mounted on small carrier platforms, which is the optimal size for CSW, we can gain an advantage over an opponent in creating a mass problem and an omnidirectional threat. In a nutshell: We are not focusing on ships for dedicated single- or multi-purpose with the option to adapt roles by changing modules. Instead we are investigating on more flexible and more agile, easier sustainable and easier exchangeable, as well as less vulnerable and less expensive components that can be combined and employed according to the operational demands by using any convenient facility. This Tier 1 Smart Defence (SD) project is led by the COE CSW with Germany as Lead Nation– in fact it is the first time that a COE drives such SD project! Several nations are already participating; more have signaled interest in joining. 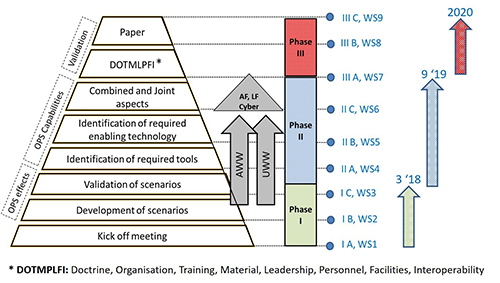 The project plan foresees the project to be split into three phases, with each phase consisting of various workshops. The perceived end of SD 1.1044 FIT FOR CSW is end of 2020. Within the project, three workshops have been conducted, with a kick-off meeting/workshop in September 2017, in Kiel, a 2nd workshop was organised by the Polish Naval Academy in Gdynia with a 3rd workshop in Klaipeda, Lithuania, organised by the Lithuanian Navy. During these two last workshops, extensive work has been done on finalising the scenario and accompanying vignettes. The current status (Oct 18) of the project is, that existing vignettes will now be transformed in a matrix, utilising NATO’s Capability Codes & Capability Statements.